Funny enough, there is no chili in there, nothing spicy. But how would you call it? See, it is like a chili but without chili peppers or chili flakes. Really it is like one… Only without the main ingredient! Oh, I am loving my monologue, I feel like in an episode of Seinfeld or something! Back to this perfect recipe for this end of summer and back to school, it’s an amazing juicy meaty dish that you can enjoy in a bowl in front of TV or at the diner table with your kids with a tortilla crepe. The next day, pack it for your lunch at work and for your kid’s school lunch! 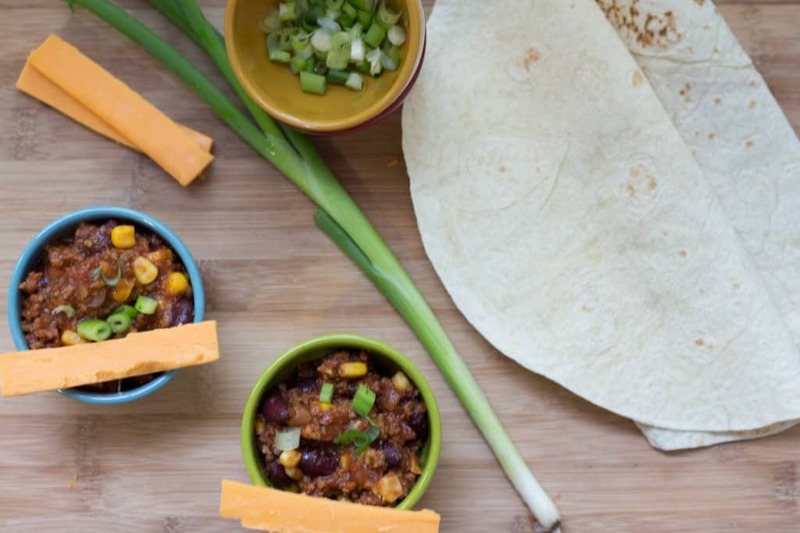 Some cheese like cheddar compliments that chili perfectly! Shredded or a good chunck, your pick! At home, the kids love a long string of melted cheese hanging for their mouth to the plate! Well, not just the kids. Also, the recipe is super easy to put together then let it simmer and voilà! Diner in no time. Super easy. While we are here talking, I wanted to share a link with you. I am super exited and nervous at the same time. Remember when I was MIA a couple of weeks ago? I promised that I would explain why I was so silent… I did explained a little: I had French family visiting and it was awesome. Also… Something else, something different. Here is the link and we will talk more somewhere at the end of October-begining of November. Pinky promise by then, I will know it all. Visit this show page: Pressure cooker. Now that I teased you, we all have to be patient to watch THE episode on TV or on the internet for the non-Canadian. 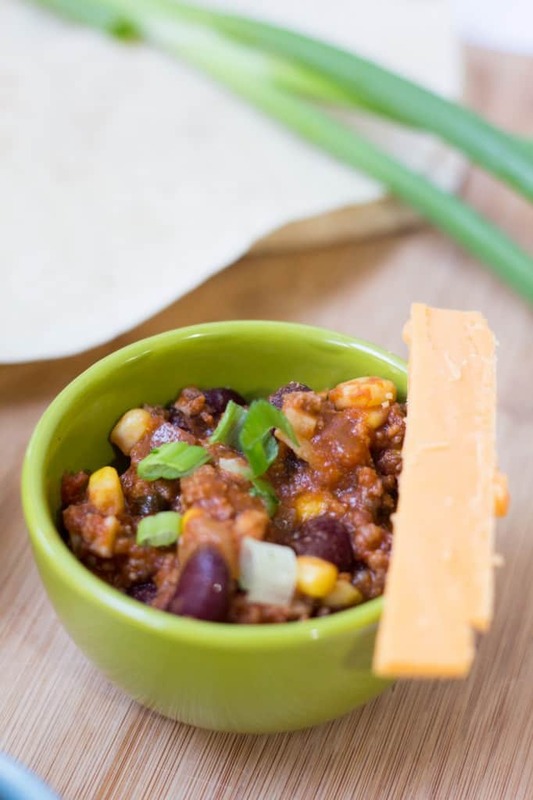 Here is a great idea for you: Watch an episode of Pressure Cooker while eating my chili! That could be another pinky promise. Lots of it lately. You know I am a Mom and all, I need to negotiate and make some promises. Part of the deal of parenthood. Worth it though. - In a pan, heat the olive oil and sauté the onion and garlic. - Add the corn, beans and the tomato sauce. Stir well. - Add salt to taste and a little bit of oregano. - Optional, add chili pepper or flakes. 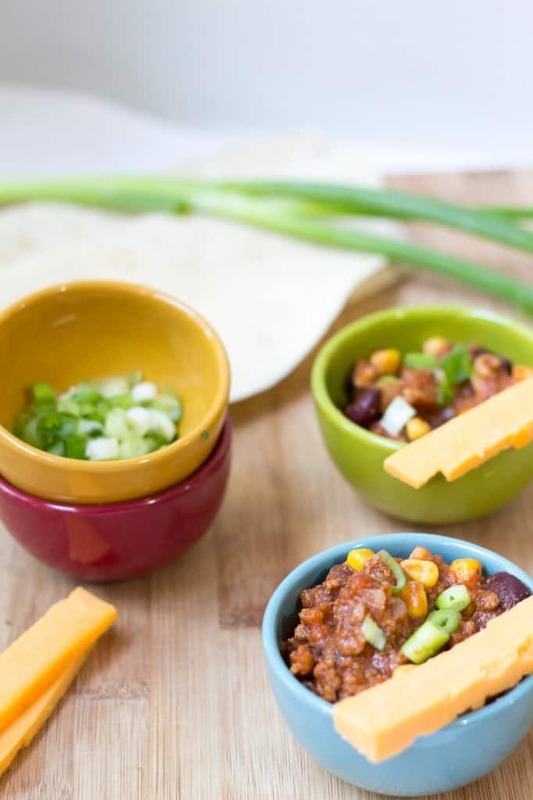 - Serve with fajitas crepes or tortilla chips - Even better reheated! Hi, I just found you on the FBC FB group and I pinned your recipe and I follow you on Pinterest. I think it’s great we helped each other in Canada. If you email me I will give you a tip to insert a code to have a pin button on your pics and it will be easier for to pin them. Your chili looks really good. Thank you so much Helene! I have been following you for some time now on Instagram but I do now on Pinterest too! FBC is amazing, great opportunity to “meet” fellow bloggers! I sent you an email, thanks for your help! Really nice idea. I always find it challenging to make food for kids. Very different palate. Can try this put! Glad I could help. Have a great day!